This is my second large scale drawing this week, worked on an A2 sheet of cartridge paper with the drawing itself being formatted to fit inside an A3 mounting card and frame. 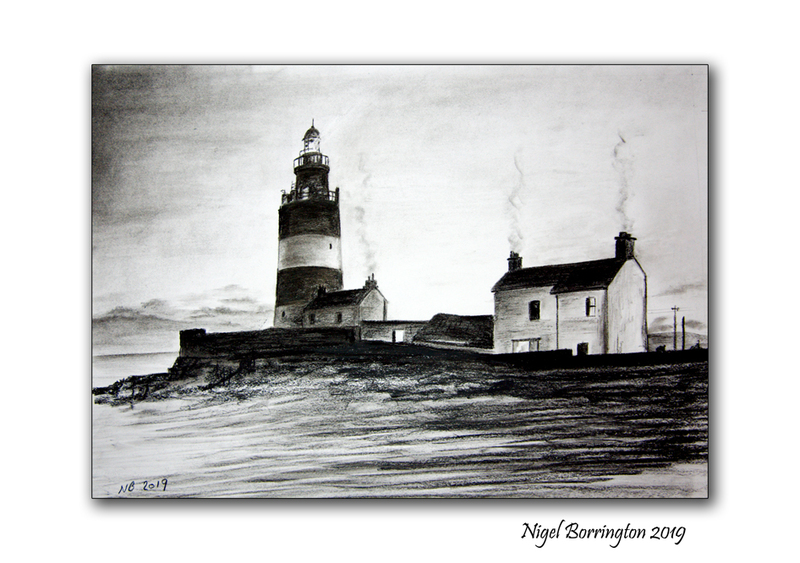 I am really enjoying working with charcoal and pastels again, I feel that I could and most likely would be able to get more detail into each drawing if I used a set of pencils, high details for each landscape view however is not that much of a worry for me at the moment. The drawings I am working on at the moment are aimed at being Proprietary Artwork for later paintings. I am learning all the time now about the possibilities of working with what is the very basic mediums of black charcoal and Pastel, the skills of blending and smoothing the charcoal on the paper, back into areas of grey. Drawing with both these mediums is very interesting, detail is possible but needs care to produce, each stage of the drawing needs fixing on the paper so that it is not smudged. 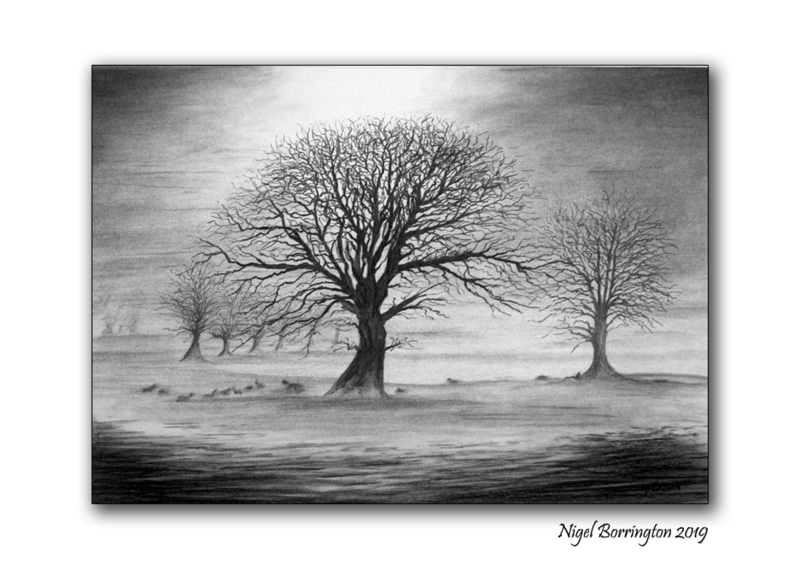 As with any drawing or painting when finished there are areas I like and areas I do not, here I loved working of the misty sky and the trees but found the foreground of the wet muddy field a challenge. I am happy overall and feel I have managed to work in lots of texture and levels of details hidden in the mud in the foreground and very happy with the blended sky. I am not in all honesty yet looking for finished work as I want to keep learning as much as possible so the more I learn the better and the more that makes me have to look and think about a finished work the better. I am not finishing anything that I would not show to anyone so that is at least very pleasing. 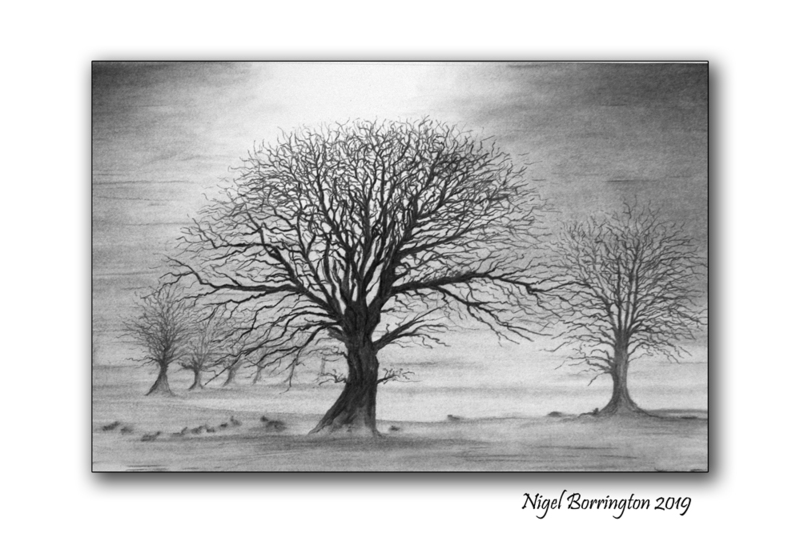 This is the same drawing cropped down, I wonder if its better without the foreground area or better with it ? This week I plan to continued building up my painting and drawing skills, I will continue selected from my landscape photographs and selecting ones that I wfeel will make good Mono drawings and paintings. 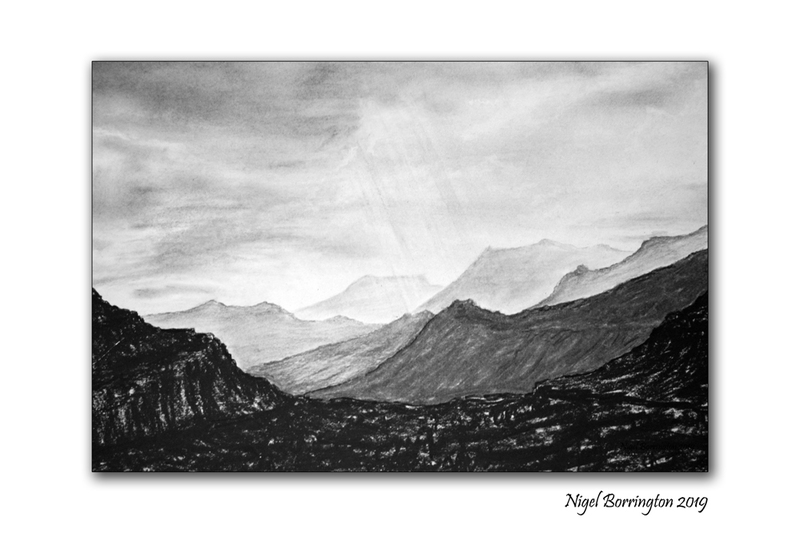 This evening I have just finished the above Charcoal and Pastel landscape, its drawn on A2 paper but framed for A3 dimensions. This is a good size from drawing as I feel I can work freely with this size, letting the charcoal move openly. It lets me stand up above by drawing board and move the Charcoal and Pastels with fully movement of my arms. 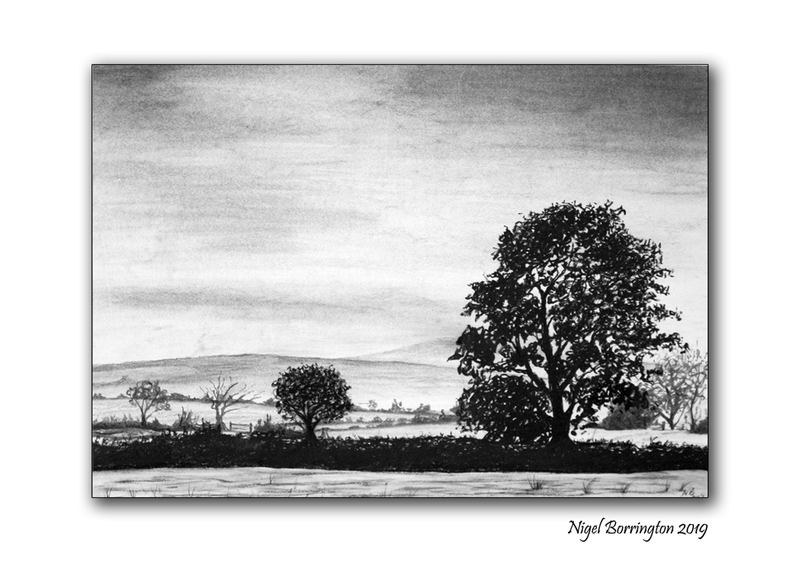 Just like with my last post I plan next to work the same landscape view in Acrylic paints working with cool grey tones to capture the feeling of a cold grey day, just like the day that I captured the original black and white image on.